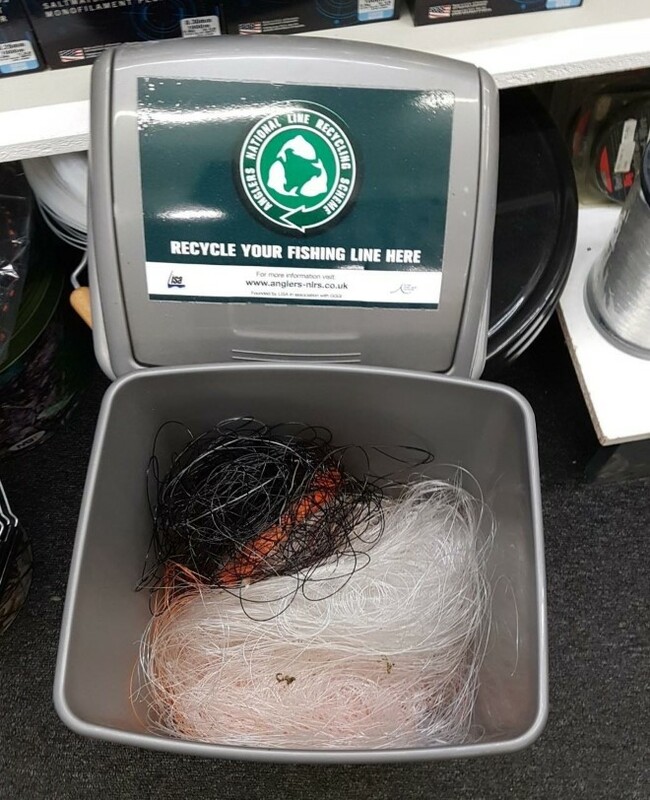 The Angling Trust has this week thrown its weight behind a national initiative to recycle used fishing line and is urging anglers from all backgrounds to participate to prevent millions of metres of line being sent to landfill every year. Most coarse and sea anglers replace the line on their reels at least annually, if not more frequently, meaning that millions of metres of used line are currently thrown away each year in the UK alone. The vast majority of this line is monofilament (plastic-based) and takes hundreds of years to degrade. Until now, the only option to dispose of used line was landfill or incineration. The Anglers National Line Recycling Scheme (ANLRS) developed from humble beginnings. In 2016, a local line recycling project was launched in Sussex by the Local Independent Sea Anglers (LISA) organisation. LISA collaborated with the Global Ghost Gear Initiative to identify a viable route for recycling fishing line and following the success of local line collections, it quickly became apparent that they had developed a project that should be rolled out nationwide. 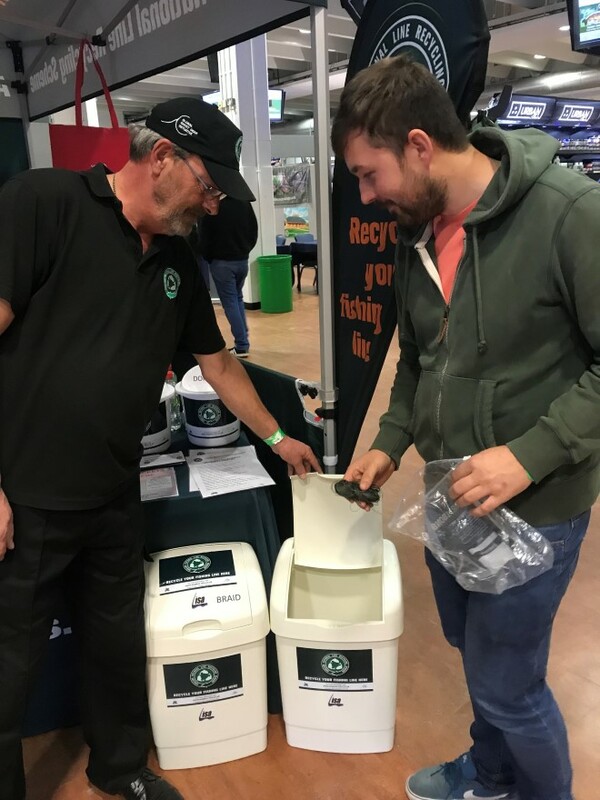 The ANLRS has grown rapidly since being launched nationally earlier this year, with over 180 fishing tackle shops and many large fisheries now supporting the scheme by gathering used line in collection bins in their retail outlets and on the bank. Major tackle manufacturer Gardner Tackle is also now backing the initiative and offers discounts on its range of lines when exhibiting at the various winter angling shows. Many other manufacturers have shown an interest in supporting the scheme in varying forms. After exploring innovative recycling methods, all forms of fishing line can now be recycled through the ANLRS, including monofilament, braided line and fly fishing lines. Line can also be posted directly to the ANLRS for recycling and volunteers have already collected more than 1.2 million metres of line within eight months of launching nationally. Viv Shears, volunteer at the ANLRS, concluded: “The goal of the scheme is to complete the circle from angler disposing of the line in a recycling bin, through reprocessing and ultimately creating a product that is manufactured from recycled fishing lines. With the support of the Trust, we hope to spread the word about line recycling across all angling disciplines and make it the ‘normal’ thing to do with redundant or discarded line. To date the reaction to the scheme from shops, anglers and angling related businesses has been nothing short of phenomenal. There is a huge potential for the scheme to spread across Europe and even further beyond that. Undoubtably the key to its success is that it is run on a purely voluntary non-profit basis and has gathered grass roots support from anglers, the tackle industry and now the Angling Trust. Viv Shears, volunteer at the ANLRS, on 07843 306661. The ANLRS website and more information can be found here. More information on the Global Ghost Gear Initiative can be found here. Images: (top) An angler recycling his used fishing line at The Carp Society's Winter Show at Sandown Racecourse. 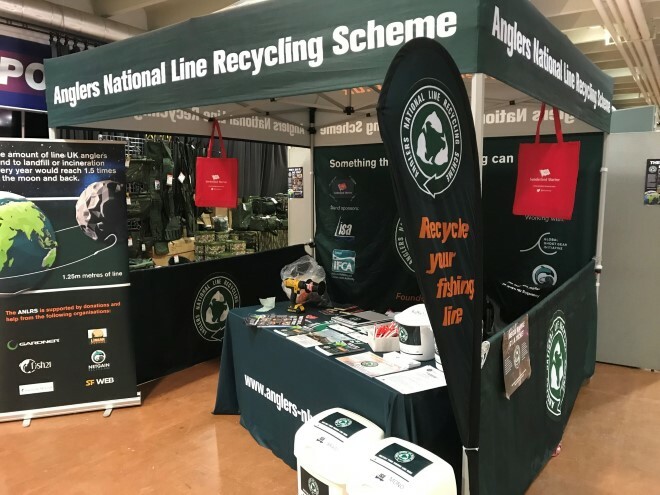 (below, left) The ANLRS stand at the Sandown Show in November 2018, and (below, right) one of the ANLRS recycling bins in a fishing tackle shop.